Gilles Duceppe, Stephen Harper, Thomas Mulcair, Elizabeth May et Justin Trudeau se prêtent au jeu des photographes avant de débattre. Photo: Adrian Wyld La Presse canadienne. Right now, I have no serious idea about just what impact the French language debate in Montreal last night might have on the Canadian federal election campaign that will end with some hopefully more or less decisive popular vote on Monday, October 19. I can, however, testify with confidence that it has been the one of the three debates so far I’ve found the most interesting and entertaining — and reassuring about the longue durée in the still mysterious country of the 21st century on all our horizons, coast to coast to coast! “Canada” is an aboriginal word, and all Canadians should remember and be proud of that. Yet it is also true that the people of Quebec today were the first people to call themselves Canadians. Through all the loose talk about Quebec sovereignty that has haunted almost the entire adult lives of English-speaking Canadians as old as I am, French-speaking Canada has retained a kind of deeply rooted attachment to and even understanding of the larger Canadian destiny, that we in the rest of the country have still not quite caught up with. (1) Three cheers to Bloc Québécois leader Gilles Duceppe (who should probably still be in all the debates — French and English), for pointing out that those who worry about the obsolete old British colonial legacy of the unreformed Canadian Senate should start thinking more seriously about the even more obsolete colonial legacy of the British monarchy in Canada! 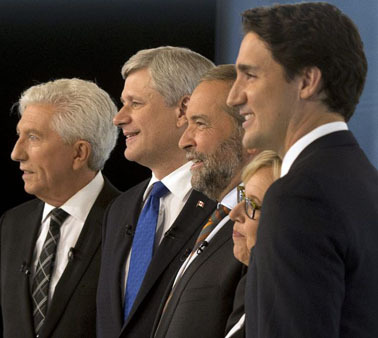 “Bloc Québécois Leader Gilles Duceppe, left to right, Conservative Leader Stephen Harper, NDP Leader Tom Mulcair, Green Party Leader Elizabeth May and Liberal Leader Justin Trudeau trade words during the French-language debate on Thursday in Montreal.” ADRIAN WYLD / THE CANADIAN PRESS. (2) The placement of Mr. Duceppe beside Mr. Harper reminded us that Gilles Duceppe was in some ways Prime Minister Harper’s original minority governing partner. The one big legacy of this partnership was the late November 2006 parliamentary resolution that the “Québécois form a nation within a united Canada” (whatever that might more exactly mean?). The longer-term problem was that Mr. Harper’s political base in the rest of the country couldn’t (or wouldn’t?) accept an avowed Quebec sovereigntist as a serious federal partner. The ultimate Harper Conservative strategy was to win more than two-thirds of the 106 seats in Ontario in 2011. (3) Whatever else, Stephen Harper from Alberta still deserves some credit for learning to speak French as credibly as he does. Last night he also seemed to be catering to his most immediate audience in his choice of a bright blue tie — emulating the blue in the Quebec fleur-de-lis flag bequeathed by the very conservative Union nationale Premier Maurice Duplessis in 1948. 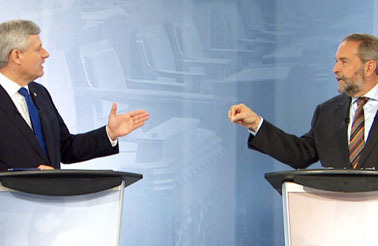 Harper and Mulcair on niqab passions in September 24 French language debate in Montreal, for October 19 Canadian federal election. (6) As in the other two debates so far, I felt all participants did well. (Though Elizabeth May’s sketchy French no doubt seriously reduces her influence in such a setting.) If NDP leader Tom Mulcair was in the hottest seat, he showed he can handle it. Liberal leader Justin Trudeau’s policy arguments also struck me as more coherent and forceful in French. And watching he and his wife, the lovely Sophie Gregoire, walking into the debate venue did suggest they could lend some useful fresh glamour to Canada’s international image if he does become prime minister — on October 19 or at some other point a little further down the road. (7) The ease with which those of us in the rest of the country who do not really speak French can nonetheless watch a French language debate on TV in instant English translation must be another remarkable sign of how Canada has come to handle its modern officially bilingual nature for we the mass audience, in either language. It seems a reasonable guess that Justin Trudeau’s father would not be very impressed by all this. But in a real world that never gets too close to any kind of perfection, simultaneous translation on TV probably is some kind of real progress. At least no serious (and ambitious) Canadian federal politician of any stripe just tries to avoid the “French fact” in Canada today. 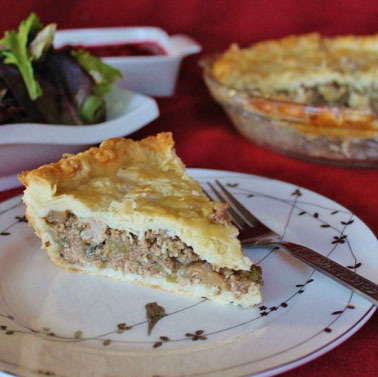 Tourtière — this ground pork pie is a traditional French Canadian Christmas Eve dinner, and just one of French Canada’s many great gifts to all of Canada today. 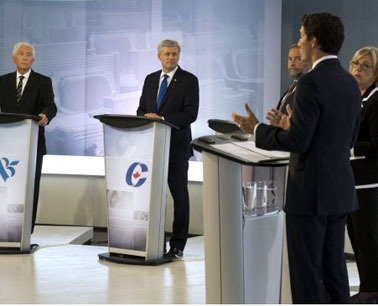 Like the French federal election debate in Montreal, on September 24, 2015.